Andrew's obsession with the Texas Longhorns has transcended football and now extends to the entire state. He's been asking for months when we can visit Texas and is now planning our trip. I don't know if he thinks Colt McCoy will meet him at the state line or if he expects that the skies are sapphire blue and the sun never sets, but either way, he's got Texas built up to be THE destination for the Henderson family. 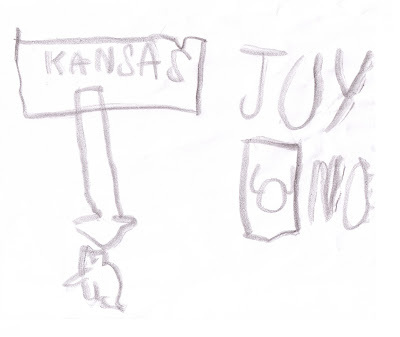 This is a drawing of Kansas - you'll recognize it in the middle, with an arrow pointing south to where Texas is. You'll recognize Texas as the tiny animal-shaped thing at the bottom. This was to show us which direction we would need to go. And the word above that is intended to read, "July." That's when he would like to go because July is his favorite month of summer and did I know that his birthday is in that month? He once again proves that he's got a will, and you know what they say about wills and ways! Thomas: "...then the cow is done." Me: "Is the cow outside or inside?" Thomas: "Outside. Cows don't go inside." Me: "Oh, that's right. Cows live outside in barns." Thomas: "Then the farmer was sad." Me: "Why is the farmer sad?" Thomas: "He just very sad." Me: "Is he sad the cow is outside?" Thomas: "No, he sad about the farmer." Me: "Well, why is the farmer feeling sad?" Thomas: "He sad because he going to jail." Whoa! I guess that he's learning something in Pre 1 after all. For only a little more than half a grand per month, you too can pay to have your child learn all kinds of neat things at school. It's been a weekend full of birthdays for the Henderson boys. Andrew was invited to two parties at his favorite celebration destination, the Gymnastics Academy. It has been the site of his own most recent parties and I don't think he would ever tire of it. Yesterday's party was for one of his current classmates who was turning five. This crowd was comprised of mature four-year-olds through five-year-old kids and Andrew was the oldest one there, as he's the oldest in his class. The mood was fairly mellow and the wildest manuever of the afternoon was Andrew's as he decided to do a swan dive at the top of the enormous inflatable slide rather than just sit down and slide like his friends. He drew a few gasps from the parental crowd but it was a fairly safe move, as those sort of things go. Today's crowd was a different, more mature one and the bar was definitely raised on the daredevil front. This party was for a school friend who is now in Kindergarten and he could NOT have been more delighted to be invited. You'll recall that when we made the decision not to send him to Kingergarten we underestimated how much he was going to miss this posse of kids, who had been together at school from the time they were infants. Reuniting at someplace like gymnastics was pretty exciting for him and some of his buddies, with whom he wasn't known for making the very best of choices. Andrew's favorite thing at the Gymnastics Academy is always to jump into the foam pit. You can either jump off the giant trampoline, drop from a parallel bar or jump off a springboard and land in a huge pit of foam blocks. It's endless entertainment. Today's birthday girl has been taking gymnastics this fall and decided to wow everyone with her newfound ability to do a front flip into the pit after taking off from the springboard. I had the pleasure of standing next to her mom when she did it, and her mom was as surprised as anyone. The kids were all pretty impressed and that just assured that she was going to flip again and again and again. About five minutes later I was standing on the other side of the pit, watching Thomas who was there as a courtesy to the birthday girl's little brother. All of a sudden, the birthday girl's dad was yelling my name and laughing hysterically. He asked if I had just been watching Andrew, which I hadn't, and said that Andrew needed to get another turn so I could see what he had done. You've probably already guessed that he had landed a front flip as if he'd been doing it all his life. As the afternoon progressed his flip progressed into a midair layout-style twist that landed dramatically about two body lengths from where he started, everytime. As the flipping and flopping portion of the party was wrapping up, the birthday girl's mom suggested that she suspects we might become familiarized with the ER at some point in Andrew's daredevil youth. She asked if I had been like this as a child, which is of course totally comical. He's definitely a chip off some block, but it's not this one! There are a few things we've got lots of in this neighborhood. One is swingsets. The backyards that touch ours all have at least one climbing/swinging structure in them. There are so many that it's comical. Appropriately, the next is little boys. There are seven of them living in four houses with adjoining backyards. The last is dogs. In five yards that adjoin ours, there are five dogs and we're not talking about dainty dogs. We're talking about Madeline, a husky, a rottweiler, a german shepherd and a labradoodle. Here's the problem. Two of those dogs are barkers. I'm not going to name names...but it's the rottie and the german shepherd. These dogs have nice people, they have nice little boys and they have nice swingsets but heaven help me, if I have to keep listening to them at 10 p.m. and keep calming Thomas after he's been woken by one, they're going to find out that I'm actually bringing the neighborhood down on the niceness scale. At some point last week when I realized we had acquired more stuff and I had no idea where to put some of it, it became obvious that some reorganization of existing pieces of stuff was in order. One closet leads to the next drawer which eventually brought us to the dining room buffet. I say "us" because, as is often the case, Thomas was right with me as my right-hand-man. Last week's mission saw me unload a good portion of what was stored under the buffet in an effort to consolidate and free up space. In that process I had a revelation which was that we have some beautiful pieces of china and silver, that came from Mark's family, that need to be used more often. It's doing no good and is building no memories sitting in boxes under our buffet so in 2009 I resolved to use it all. I need to take a page from the Erma Bombeck book that reminds us how if we wait for special occassions we might wait forever. 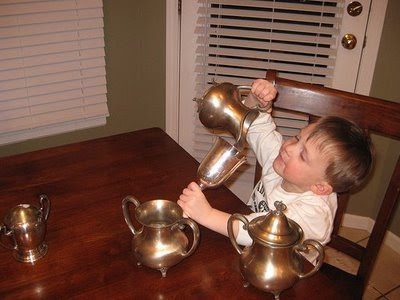 To that end, as Thomas helped me with project-somehow-create-storage-space-where-none-exists, he discovered a lovely tea service with creamer, sugar bowl and teapot. It had, I think, been Mark's grandmother's and Thomas was instantly drawn to it. My first reaction was to tell him it was fragile and that we needed to put it away. Then I reconsidered and wondered if it would really hurt a thing for him to enjoy it for a few minutes. It hadn't seen the light of day for years and a little sun does us all good. Nearly a week later he's still loving this tea set and has spent a good deal of time pouring me coffee or tea - he'll take special orders - and just generally enjoying this family heirloom. Unfortunately, I never had the pleasure of meeting Mark's grandmother, Granny, but have heard stories and I know she was a character. I know that she had lots of beautiful things and that our house would be bare were it not for many of them. I also know that she loved Mark dearly and would hopefully be pleased to see her things put to use in his home - even if it is by Thomas. During the last few years we've actually had a dining room chair - Granny's chair - that we've mysteriously found moved out from the table at odd times. I used to think Mark was moving it, and he thought I was. It turns out neither of us was moving it and so we've come to wonder if maybe Granny pays visits. I would never have even joked about such a thing 10 years ago but it's become such a regular occurance that I've sort of come to believe. It brightens my day when he asks if I would like cream or sugar with my coffee and I hope it will Granny's as well, the next time she sits at the table.